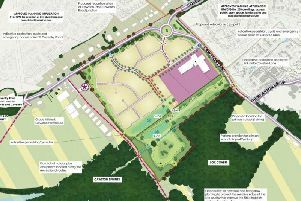 Two huge and controversial extensions to Magna Park were approved last night (Thurs) by Harborough District Council. The two extensions, to the north and south of the existing warehouse hub, west of Lutterworth, total 700,000 square metres. Many of the 120 protestors at the meeting at Bruntingthorpe Proving Ground and Aerodrome, booed the decision of the Council’s Planning Committee, which came at 11pm last night, after a four-and-a-half hour meeting. Magna Park Is Big Enough campaign leader Maggie Pankhurst said: “I’m absolutely gutted”. The larger of the two extensions, by IDI Gazeley, which will run along the A5 to the north of the existing warehouse zone, was passed by just one vote. The two extensions, when occupied, will bring an estimated 10,000 new jobs to Magna Park, and double its size. The northern extension would also include a Logistics Institute of Technology. Councillors, supported by a team of 15 council officials, had been greeted at the Extraordinary Planning Committee meeting last night by protestors in anti-pollution masks. Lutterworth is already an official air quality black spot, and protestors say extensions to the park - bringing more HGVs and thousands more workers’ cars - can only make the situation worse. At the meeting, inside Bruntingthorpe’s cavernous Hangar 42, District Councillors were told by council planning official Mark Patterson that the benefits of Magna Park in bringing wealth and work to the district and the region, outweighed the harm caused. Council officials recommended that planners approved both extension plans - the northern one proposed by IDI Gazeley and the southern one, proposed by DB Symmetry. All the local people who were allowed to speak at the meeting completely disagreed. The district council’s own Cllr Jonathan Bateman said the proposals would affect the quality of life of local people by worsening both traffic congestion and air quality. The local protest group Magna Park Is Big Enough’s (MPISBE) spokesperson Maggie Pankhurst said people living in Lutterworth and the villages around Magna Park had objected in their hundreds but felt ignored by Harborough District Council. Protestor Edmund Hunt from MPISBE said a doubling of warehouse space on Magna Park would mean a doubling of the traffic movements it brought to an already congested area. MPIBE’s Tim Ottevanger added there was no need for a Magna Park extension, with Leicestershire’s forecast warehouse need by 2031 already fulfilled by existing schemes across the county. Sheila Carlton (MPISBE) said the proposals were “the wrong sort of jobs in the wrong place”, because the Harborough district had low unemployment and needed more skilled jobs, not more warehouse jobs. Bill Piper said Harborough District Council favoured Magna Park simply because it brought in big business rates to council coffers. He said approving the extension plans was simply “money grabbing by the District Council”. And Malcolm Stringer, who owns Bittesby Stables on the A5, said the northern Magna Park extension would bring the huge warehouses “110 metres from our kitchen window, and in clear view”. Speakers at the meeting who argued in favour of the two extensions were all connected with the two large companies behind the plans - IDI Gazeley and DB Symmetry. Peter Frampton of Frampton’s Planning pointed out that a major reason for the need for more warehouses was actually down to the public - “the growth in internet purchases has been exponential”. Michael Parkinson, for DB Symmetry, said his company’s plan was the result of a “long process of collaboration” and a “comprehensive package of mitigation”. And Charles Mylchreest praised the southern sites “contained nature”. Nora Galley of Now Planning reminded the meeting that efficient distribution from hubs like Magna Park was critical for the productivity of the whole of the UK economy. The IDI Gazeley scheme also brought heritage benefits, argued Simon Mortimer of CGMS, by contributing a local heritage centre and protecting archaeology at Bittesby deserted medieval village which was actually being degraded by agricultural use. Landscaping and a Country Park would cover 49 per cent of the northern site, added Andy Cooper, a charted landscape architect. Gwyn Stubbings, the Planning Director of IDI Gazeley, said the northern extension brought a wide range of public benefits, including a Logistics Institute, a heritage centre, extensive lorry parking and a Country Park. He praised Magna Park as a “unique and pioneering logistics cluster”. Two local district councillors, neither of them on the Planning Committee, then argued against the Magna Park expansion plans. Cllr Geraldine Robinson said: “I feel our residents and the objections they put forward, are being ignored. And Cllr Rosita Page said the Magna Park proposals would bring more traffic, noise and air pollution to the whole area. After a 15 minute break, the Planning Committee’s own deliberations seemed subdued by comparison with what had gone before. Cllr Simon Galton said he was struck by “the sheer scale of the visual impact” of the IDI Gazeley scheme in particular. And Cllr Neville Hall raised the possibility of saying “yes” to one of the applications and “no” to the other. “This proposal may benefit us on a national level but not on a local one” argued Cllr Sindy Modha. For a moment it seemed as if at least one of the big schemes might be turned down, offering some consolation to local protestors. The DB Symmetry scheme south of the current Magna Park, with its 280,000 square metres of warehousing, was then approved by seven votes to four. The northern IDI Gazeley plan, with 420,000 square metres of warehousing, was passed by six votes to five. After the long meeting, Maggie Pankhurst of MPISBE said the fallout from the two decisions would be felt across Lutterworth and the surrounding villages for 50 years. “As we’ve said all along, it’s the wrong type of development in the wrong area” she said.